Walnut oil is an expensive specialty oil that is light in color and nutty in flavor. But How to produce this kind of oil and where to buy quality walnut oil press equipment? Generally speaking, you should buy walnut oil press equipment from professional manufacturers. If you want to make walnut oil, you should follow a series oil making procedures like cracking, cleaning, pressing and certain oil processing machinery are needed too. Walnut oil press equipment, however, is of the most important oil processing equipment in the entire production process. 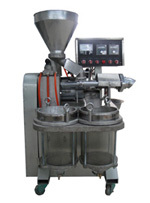 Such type of walnut oil press equipment is virtually made to process walnuts. This type of is of compact structure, it really is light-weight as well as simple to be effective. It could possibly instantly separate out oil with a excessive output ratio. Our walnut oil press equipment is perfect for mobile operations for instance at a vegetable promote, a nationwide supermarket, a bazaar inside the country side, or possibly from your own home. The residue works extremely well as environment friendly fertilizer or investigation. Quality warrant conditions is for one full year. Any faulty which are resulted in by equipment-self and quality will probably be dependable for us. Others that are brought on by operation mistakes, man-made problems, etc will probably be in charge for clients themselves. Anytime you are interested in our walnut oil press equipment, please let us know, we are pleased to give the best service!